The Federal Brewing Company's plant shown in this circa 1905 poster is representative of the hundreds of red brick breweries that were constructed throughout America in the second half of the nineteenth century. Federal, itself, remained in existence but a few years, but its roots go back to 1854. In that year, Samuel Duell started the Long Island Brewery at 83 Third Avenue in Brooklyn, just a short distance from Flatbush Avenue. 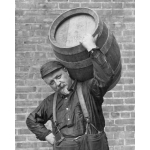 Only ale was brewed until 1887, when lager was added. In 1902 there was a change in ownership, and the plant became the Federal Brewing Company. As Federal, however, the brewery lasted but five years, going out of business in 1907. The building itself has gone through several different uses since its days as a brewery. It still appears, however, much the same as when pictured seventy years ago on the poster, except that the handsome corner turret has somehow been removed in the intervening years. Since 1961 the former brewery has been the home of the Quality Cosmetics Corporation, manufacturer of Monique hair and skin products.